Lambert shows that he can nail the beat in “Another One Bites the Dust” and create the heat with “Fat Bottom Girls” all while wearing platform shoes that only KISS fans may notice and approve of. By the time he sang, “I Want It All,” I was sold. 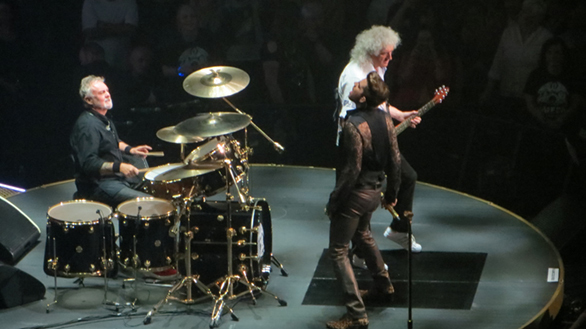 By mid-show, the all too humble Brian took the stage with a heartful rendition of “’39.” Afterwards, Roger arrived with a a very reminescent take of “Days of Our Lives” with clips of Freddie Mercury and the band featured on the big screen. This nostalgic moment was perhaps the best part of this concert. 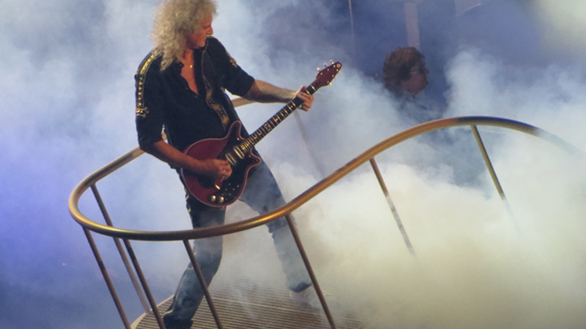 Afterwards, May gave audiences a real treat by showing the range of what his guitar, the Red Special, can do. I could not help but shed a tiny tear. This moment was what I was waiting for all my life for to see. Some songs in this band’s repertoire are owned by Freddie and they cannot be matched. Covers are fine and to own it means being capable to show how each performer’s personal range can sell it on stage. “Love of my Life” brings Freddie back to life in the final chorus-line on the massive Stargate (the letter O) styled silver screen with May providing a live accompaniment. To sync that up right requires the talent of an excellent technical crew and Freddie returns in more than just this number. Even “Crazy Little Thing Called Love” can be a challenge. Lambert channels his best Elvis Presley and the crowd went wild. But the solo is what I paid attention to. I can sort of play the chords of this rockabilly song and struggle through a few measures of the solo on Kei, my guitar. But to see how May fluidly does it through the telescopic lens of my camera shows I have a long way to go. He is a guitar virtuoso. The range of tunes this concert covered were nearly all the hits in this band’s history. If I could only time travel not to the year of 39, but to 86 instead, what’d be assembled would be me at Wembley Stadium to the best sight ever seen: Freddie at his peak. 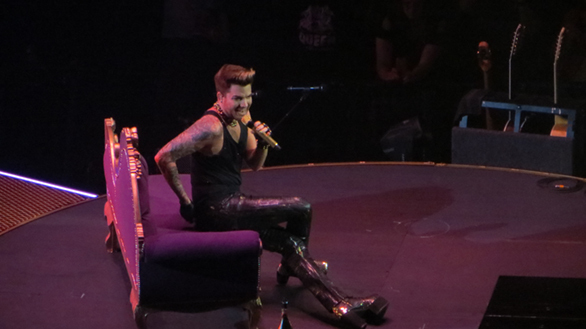 In what Lambert offered in this show, he’s definitely a Mercury rising.